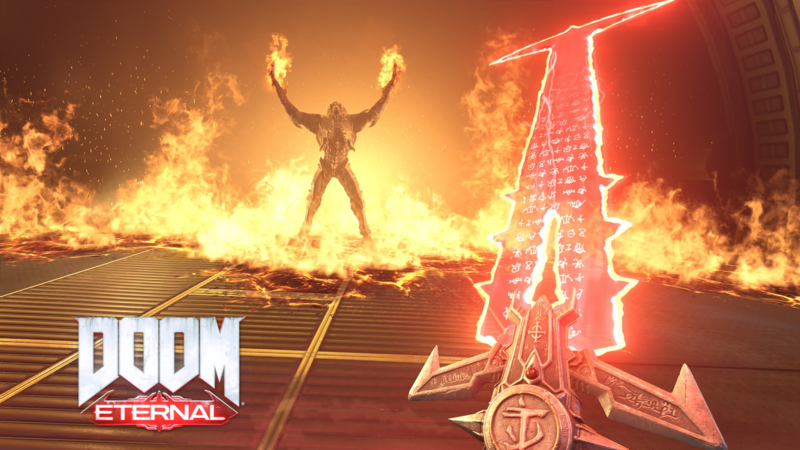 DOOM Eternal was revealed during QuakeCon 2018, where a gameplay video gave us the first look at the next chapter of the fight against the forces of Hell. This time around, the Doom Slayer will be even more aggressive in combat thanks to new abilities to close the gap with his foes. In an interview published by GamesTM magazine (issue 204), id’s Creative Director Hugo Martin and Game Director Marty Stratton said that the game will make players feel unleashed and that the new abilities are the natural evolution of movement in DOOM. Hugo Martin: A hero is only as strong as the enemy that they defeat and if you want to feel like a badass you’ve got to wreck some amazing bad guys along the way. And Doom Eternal has some incredible enemies. We want you to feel unleashed, like nothing is holding you back. This is a pure, unfiltered, action FPS experience. Eternal will still feel like Doom, even after we have added in these new abilities. Being able to close the distance between enemies faster will make you feel more aggressive… and we are always encouraging the player to play more aggressively. When that’s the underlying theme of a new mechanic or ability we know that it’s going to work. Marty Stratton: It all comes down to us trying to define the things that we felt were missing or are the next evolution of. That’s where something like the dash comes in. In this particular case, it’s like… well, where has this been all my life? It’s such a natural component of Doom’s movement now. Hugo Martin: There’s a reason that the spaces are larger. If you make a faster race car, you’re going to need a bigger race track. Your closing speed is outrageous. It’s actually one of the most thrilling things in Eternal. How many games can you see someone from across a giant sci-fi space and then, like on a skateboard, just rocket towards them and just smash them in the face? It’s the best feeling in the world. Especially now, with all of the different abilities that we’ve introduced. It’s all about closing those distances, and now you can do it in seconds. Marty Stratton: The meat hook is a good example of what Hugo said before. It’s about being more aggressive and getting you to push forward. We just want to get you closer to the combat; in the case of the Meat Hook, it doesn’t grapple any point in the world, it only hooks demons. That use of it is always pulling you face to face with a demon. Hugo Martin: Doom Eternal is, as Doom was, an epic action game. It’s like this big Nineties action movie; you want to feel like you are doing fantastic things, and these tools will allow you to do even greater things this time around. DOOM Eternal doesn’t have a release date yet, but we know it will be available for PC, PlayStation 4, Xbox One and Nintendo Switch.